If you garden then you know that a garden attracts just about every animal in the area. They all want to party in your backyard. We have learned how to make a rabbit repellant and that lifeboy soap will help keep squirells away. 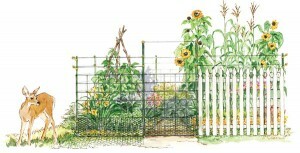 Now Mother earth news shares different types of fences to keep them out . They talk about fences for small critters and deer and how to make them look nicer.